Traditional security protection for computing devices in our home is no longer enough. This is because we no longer want only our laptop and desktop computer protected, we now need to protect Baby Monitor, Microwave, Television and all the other smart devices in our home. Traditional malware and virus protection software doesn’t work on these devices and this is where F-Secure Sense comes to the rescue. "Today households have at least six Internet-connected devices which are all susceptible to online threats and hacks. Tomorrow the number could be 50 and in some years maybe 500. Unfortunately, securing these devices and ensuring the consumer's protection from common threats are usually afterthoughts for most businesses," stated Mika Majapuro, Director of Product Management at a F-Secure. For only 199 EUR/USD per year F-Secure Sense will protect your smart home appliances, for this amount you get the device and the Sense security software for as many devices that can run it. The app supports devices running anything on or newer than Apple iOS, Android and Windows. All your appliances will to F-Secure Send when then connects to your home wireless router and creates its own secure network. It then analyzes the traffic coming to or from any device on that network, finding and blocking potential threats. 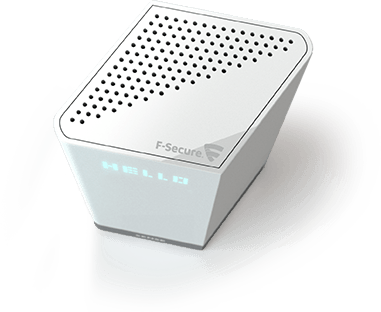 F-Secure SENSE uses it own Security Cloud to secure Internet traffic going in and out of homes, and lets you manage the security of your network and devices with a simple mobile app. According to F-Secure, SENSE is an entirely new, more holistic way to provide security -- it protects your living space, not just your devices. The technology uses a unique machine-based learning technology to proactively "sense" threats hidden within Internet traffic. SENSE’s LED display doubles as a clock and thermometer. Other specs include a 1GB Flash storage, 512 MB RAM and a 1GHz dual-core processor. It supports Bluetooth 4.0 and low-energy Bluetooth and has one USB 3.0 port. "SENSE is the first product we've built that brings the full security benefits of the cloud to consumers," said Samu Konttinen, F-Secure's executive vice president of consumer security. "It goes beyond traditional device scanning by using artificial intelligence baked into our Security Cloud to anticipate problems before they hit you, because you're already too late if you wait for criminals to get into your home”. F-Secure SENSE is due out this Spring, also after the first year, subscription renewals cost 8 EUR/USD a month.